This wasn’t my initial dinner plan, but when I realized I had some leftover smoked salmon (from the recipe I originally made to go with my Brown Soda Bread with Steel Cut Oats), I thought back to a certain restaurant meal. I was able to get the recipe, which called for one 8-ounce package of cream cheese for 10 eggs, along with some heavy cream. The reviews were phenomenal, but the dish was also a fat and calorie bomb…and actually a little rich for my liking. I had one of those 3-ounce packages of cream cheese on hand and figured I would use that. As it turned out, I used just over half for 8 eggs, and it was plenty to flavor the eggs in a creamy, unique way. One to one-and-a-half slices of smoked salmon for every two eggs is a good ratio. Dice the cream cheese and keep in the fridge until ready to toss in the pan. I paired this with a side of Sauteed Kale with Pancetta. It was an easy meal that was special, too. Although we ate the eggs for dinner, this would be an amazing breakfast or brunch dish and perfect for company! In a large, greased skillet, scramble eggs over medium-low heat, adding a pinch of salt and a few grinds of the pepper mill. 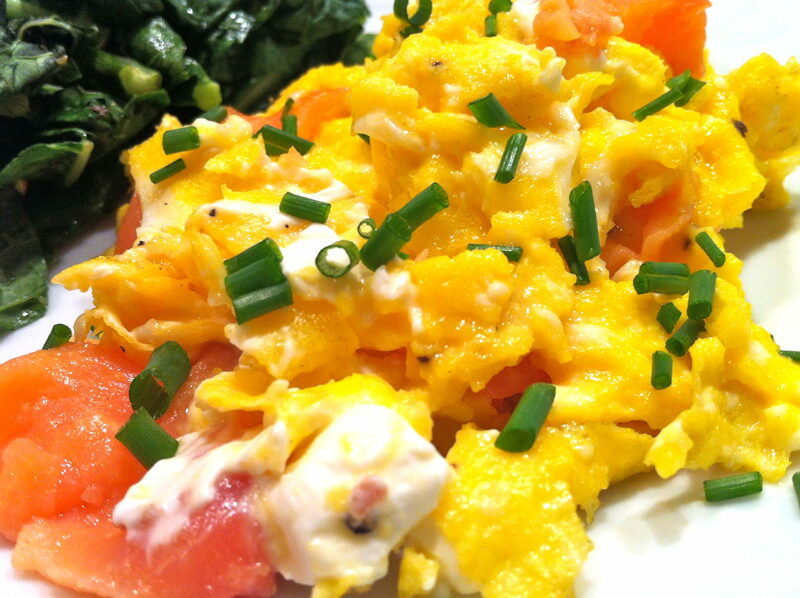 When eggs are just about cooked to your liking, gently stir in the cream cheese, then the smoked salmon. Garnish with snipped chives. Delish twist on scrambled eggs!! I’m not even a huge cream cheese fan–my kids love it–but this recipe converted me! So easy, too!